M750rc 7x50rc is rated 5.0 out of 5 by 5. Rated 5 out of 5 by wayneg from best warranty ever I had these binoculars for years and they were pretty tattered. I sent them back to Steiner for repair and, with no questions asked, they sent a brand new pair (or at least they looked new). I would;t buy any other binoculars. Steiner are the best. Rated 5 out of 5 by Jim D from True Lifetime Warranty For 35 years I trusted these binoculars taking collision bearings at sea, particularly at night. When the compass froze, I sent them back for repair and received in the mail a package with a brand new pair. No charge, even for shipping, and no questions asked. The night vision and stability of the compass on a moving deck inspire confidence. I own another brand of equal cost that I sometimes use during the daytime but never at night. When life is at stake, Steiners are a bargain. Rated 5 out of 5 by DanL from Great product. Great warranty I have had a pair of 750C's I bought 30+ years ago and used and abused in the middle east, Africa and lots of time on a boat and in the mountains. Love the sharp optics, low light, durability and everything about them. But, the compass had stopped working, coating peeling etc so I sent them to Steiner to get them reconditioned. Less than a week later a new pair of M750RC showed up. Great product, great company. Hi I have a model: Commander military 7x50 c I dont see any info on your site. Where i can see the serial number. ? It will be located on the center hinge pin. It will be two five digit numbers. While all of our compass-equipped models have HD-Stabilized compass reticles, we do not offer any binocular models with stabilization when viewing. This unit uses a 1.5 V 350 battery. What battery is used with this binocular? 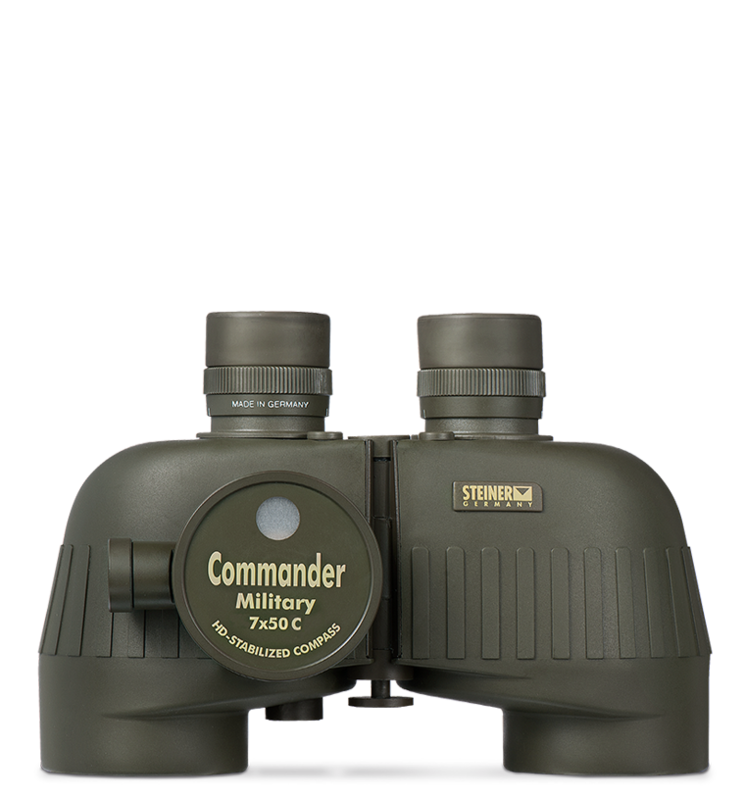 I just purchased a used pair of military commander 7x50rc (383) binoculars. The optics are fantastic, but the compass has a black smudge between 05 and 10 degrees. Is it possible to repair this myself? How how does one replace the battery on these? Hi there I have a commander 7x50 with compass, my compass was broken and need to replace with a new one. I lived in Hong Kong, Pls let me know can I get a new compass to replace it.? How much? Please advise me how to change the battery of comander 7x50rc steiner binoculars? Hello, Simply remove the battery cap with a coin or other object, replace battery, and reinstall cap. Done!